In many European countries and throughout the U.S., sauerkraut and pork (either sausage or chops or both) is traditional - especially on New Year's Day. The French call it Choucroute and in America the recipe and tradition are credited to the Pennsylvania Dutch, but no matter who invented it and who eats it, I love it! This recipe came to me from Diane, my boyfriend's mom, and this is my interpretation of her most delicious recipe after eating it on New Year's Day and hearing her describe her approach. I never thought much of sauerkraut until I tried her recipe - the method and ingredients create a mellow, slightly sweet kraut without any of the sting of acid from fresh or lightly cooked kraut. Drain and rinse sauerkraut well under cold running water. Let drain well and empty into a baking dish. 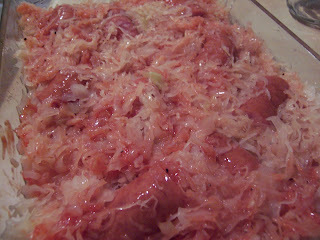 Cut kielbasa into chuncks and nest in the kraut. Meanwhile, mix remaining ingredients and pour over kraut and sausage. Salt and pepper to taste. Bake, covered, at 350 for 2-4 hours (or longer) or until most liquid has absorbed and kraut and sausage are browned and caramelized. The longer it cooks, the more mellow and sweet it will taste. Ohh I love kielbasa and sauerkraut! I've never had the sauerkraut cooked for such a long time so mine always has that acidity. I will try your method the next time I make a batch (it's often!) and I can't wait to taste the difference! 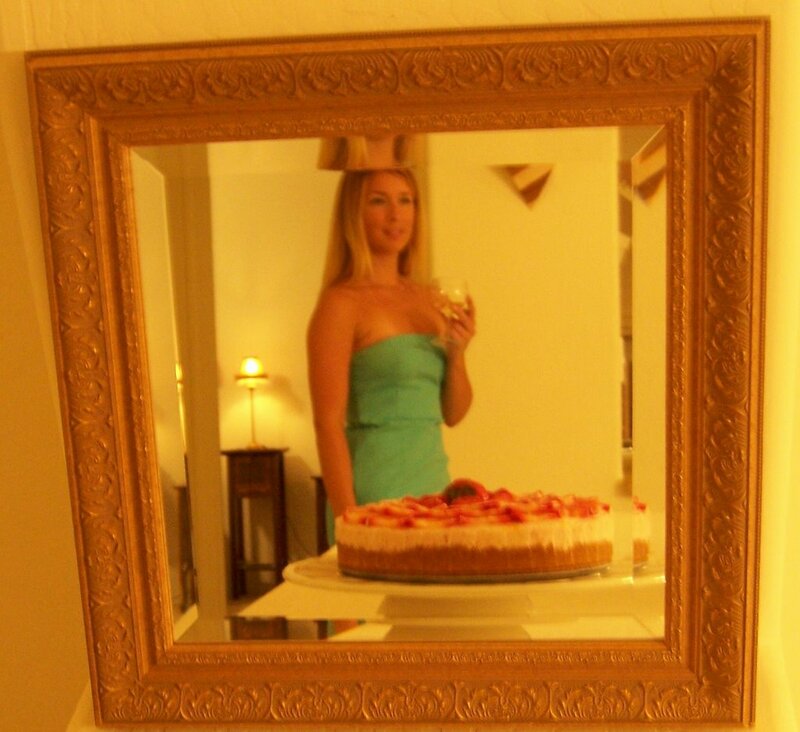 I really think that I want to live with you... you have the best meals! My mom always made this so I am having a childhood flashback. 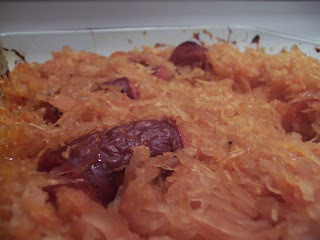 I just posted my lil' sister's recipe for kielbasa an' kraut. It must be the food gods telling me it's time for me to make it myself. Hi Lis, Kristen, Peabody & Jerry! I feel like I missed out on a core comfort food thing growing up because my mom hated sauerkraut and never made it, but now I am a fan. The way Diane made it was so good. All the initial vinegar/acid notes seemed to have melted away into flavor, plus the pork fat from the sausage braises and melds with the kraut. Yum! Although my grandmother was German, I've never had sauerkraut - yours looks delicious! 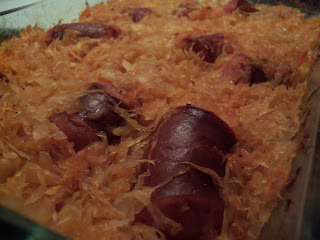 I just stumbled upon this recipe last night as I was wondering if we could put kielbasa and kraut in a pan and bake it. Prepped it last night and put it in the oven when I got home from work today. Can't wait to try it!